Radar security refers to the systems are widely used to monitor residential and commercial environment for security purpose. Radar security offers advantages over monitoring human trafficking, illegal entry of immigrants and illegal import & export. Radar security system provides early warning and gives time to develop a response to a risk at the same time as reducing some of the need for solid barriers and wire fences and other formal security controls. Global radar security market is anticipated to flourish at a CAGR of 6.3% during the forecast period i.e. 2017-2024. Further, the market of radar security was valued at USD 17.8 Billion in 2016 and is projected to garner USD 30.1 Billion by the end of 2024. Factors such as increasing demand of radar system in military application are making headway for the growth of the global radar security market. 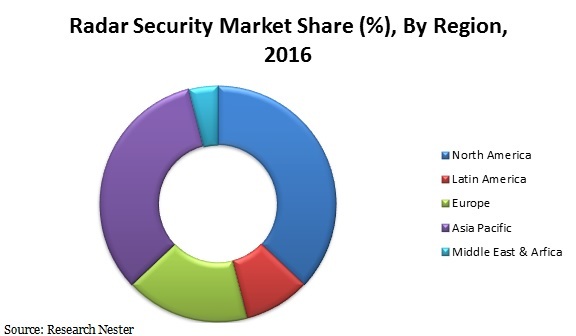 Moreover, high demand for radar security systems worldwide by the countries for securing their borders and critical infrastructures is anticipated to positively impact the growth of the global radar security market. Geographically, North America is anticipated to account for a significant portion of market share in the overall market of radar security during the forecast period. Factors such as increasing need for the radar security products are gaining momentum from various applications such as ports and harbor security, critical infrastructure protection, and highway security systems is anticipated to fuel the growth of the North America radar security market. Based on product type, radar security market is segmented into ground surveillance radar (GSR) systems, air surveillance radar (ASR) systems, marine surveillance radar (MSR) systems, out of which, marine surveillance radar (MSR) systems radar security segment is expected to dominate the overall radar security market during the forecast period. Increasing safety & assistance features across the globe is anticipated to intensify the growth of the global radar security market. In addition, increasing critical infrastructure protection is anticipated to positively drive the growth of the radar security market. Apart from this, rising adoption for various applications is anticipated to be the dynamic factor behind the growth of the radar security market. Growing safety & assistance features offered by the usage of radar security has increased the security concern. This factor is anticipated to supplement the growth of the global radar security market. Further, rising number of radar security companies are likely to further strengthen the growth of the radar security market. In addition, the market is witnessing the launch of new and innovative radar security such as drone detection radar. This factor is likely to spearhead current and future market growth prospects. However, recognizing short range target type’s radar security systems are some of the key factors which are expected to limit the growth of global radar security market in upcoming years.